Mint Museum, Discovery Place, Museum of the New South, Billy Graham Library, Time Warner Cable Arena, NASCAR Hall of Fame, Charlotte Convention Center, Concord Mills Outlet Shopping Mall, Lowe's Motor Speedway and Drag Strip, RaceWorld, U.S. National White Water Center. Perched atop Charlotte's newest entertainment and retail complex, the EpiCentre, is the equally exciting and hip new hotel brand by Starwood Hotels, the aloft. 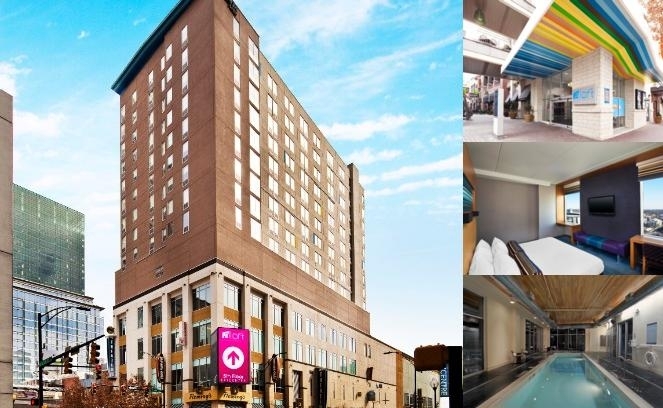 Located directly in the heart of uptown Charlotte, the Aloft is the answer for this trendy city with its high tech accommodations, WXYZ Bar, and yet family and pet friendly all at the same time. The property is located in the center of Uptown Charlotte's financial and entertainment district that include corporate headquarters for Wachovia and Bank of America. The Aloft has it all and its outstanding location is perfect for business and leisure travelers alike. A walk in any direction leads to restaurants, museums, convention center and sporting venues such as Time Warner Cable Arena and the Bank of America Stadium, home of the NFL Carolina Panthers. Yes, Make a green choice allows guests to receive either a $5 voucher or 500 SPG points for forgoing all housekeeping service during their stay. Hotel Features – The Aloft Charlotte Uptown at the EpiCentre is a chic hotel located in the center of North Carolina’s financial district. For those traveling on business who also want exposure to fine dining, exciting experiences, and a thriving nightlife, this hotel is the place to stay. Fine amenities and high-tech guest rooms make the Aloft a contemporary, hot spot hotel. Guest Rooms – Rooms feature nine-foot ceilings and huge windows perfect for letting in nature’s alarm clock after a night on the town. Oversized walk-in showers are complimented by Bliss Spa bath products. Guests can choose between queen and king size beds in rooms that all include a work space perfect for staying in touch with your boss, or checking in with the family back home via e-mail. Nearby Attractions – Sports complexes, night clubs, amusements parks, you name it, Charlotte has it! For starters, guests can catch a NASCAR race at the Lowe’s Motor Speedway, or a Carolina Panthers game at the Bank of America Stadium. For those who prefer to stay away from the cheering crowds, the Paramount’s Carowinds park can provide plenty of fun for families looking to experience thrilling rides. The Mint Museum of Art, and the Daniel Stowe Botanical Gardens also provide entertainment for those who seek more refined, quieter activities. Perks & Amenities – Guests have access to an indoor splash pool surrounded by pod lounges with access to complimentary Wi-Fi. There is also the re:Mix Lounge, perfect for mingling with other guests or simply people-watching after a long day. For the kids, camp Aloft for Kids provides guests under twelve with special bedding, food choices, and activities. There are also kiosks for checking in and out of the hotel, and even for checking e-mail. Expert Tip – Although this hotel appears to be created for the young and hip business crowd, there are plenty of special services and amenities for kids and families. Individual reservations may be cancelled by 4PM day prior to arrival. Dogs up to 40 pounds accepted. ARF program in place. Charlotte-Douglas Airport,located 9 miles from the aloft hotel. One way taxi expense is estimated @$25.00. Below are the meeting, banquet, conference and event spaces at Aloft Charlotte Uptown at the Epicentre. Feel free to use the Aloft Charlotte Uptown at the Epicentre meeting space capacities chart below to help in your event planning. Hotel Planner specializes in Charlotte event planning for sleeping rooms and meeting space for corporate events, weddings, parties, conventions, negotiated rates and trade shows. 25 x 40 x 12 Ft.
30 x 20 x 12 Ft.